Our advanced mercury analyzer, the RA-915M Portable Zeeman Mercury Analyzer by Ohio Lumex, measures mercury vapor concentration in stack gases and natural gas streams. It is top of the line in mercury detection. 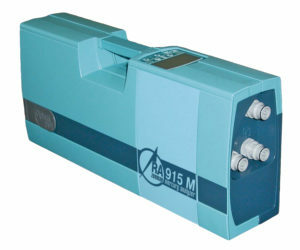 Our RA-915M Mercury Analyzer is a portable multifunctional atomic absorption spectrometer with Zeeman Background Correction, which eliminates the effect of potential interferences. It is the only highly sensitive mercury analyzer that does not require gold amalgam pre-concentration and subsequent regeneration. This enables the user to conduct real-time, second-by-second monitoring of vapor phase mercury and has an extremely low detection limit at 2 ng/m3. Our system has a wide dynamic measuring range and captures up to 122 continuous hours of data acquisition, averaging, and data storage. Sorbent trap analysis for M324 range from 1 – 100,000 ng. The best technology available is just another facet of The Alliance Advantage.